Beloved Readers, As you know, you did not get Conference posts as I had planned. I thought I had my iPad all set and connected to the blog as I had been able to publish with it here. However, it would not connect at all. So I just had to relax and let you not follow the conference with me. My apologies. I do not know why or what got in the way, and could not take the time to dig into the problem there. So…. The Conference was excellent, but even giving you the details of the sessions I attended would not adequately give you the sense of it all. I was able to visit with friends and make some new ones and be with our group. When you travel with a group, you have a way of getting to know one another more deeply. It was a very good time in our Lord Jesus! I am deeply thankful for the partners in ministry I have in Psalm 19 and in New Heart Ministries. It was a special time. I have changed the header to daffodils as the miniature iris’ have ceased blooming and the other iris’ have not yet begun, but my daffy’s have. 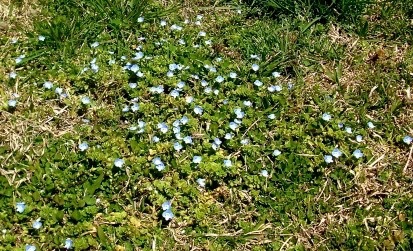 I love the spring flowers – my lawn has a lot of little ones. That means it has weeds in it, I know, but I mow them and bless them and they look like grass. Does a good work. Maybe someday I will have the time to dig it all up and put in new sod. Not this year – truthfully, probably not ever. Thanks for reading, and I will be posting later this week – some studies. Stay tuned.